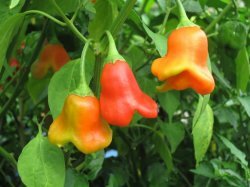 The Bishop's Crown or Christmas Bell, is a pepper, a variety of the species Capsicum baccatum var. pendulum. It is named for its distinct three-sided shape resembling a Bishop's Crown. Although this variety can be found in Barbados, and is actually part of the species Capsicum baccatum var. pendulum. It may be indigenous to South America. Today, it is also found in Europe, possibly brought there from Brazil by the Portuguese sometime in the 18th century. The actual plant is relatively large, being 3 to 4 feet in height. It produces 30 to 50 peculiar, 3 or 4 flat-winged, wrinkled pods. These somewhat flying saucer-like peppers grow to approximately 1.5 inches wide. The flesh inside each pepper is thin, yet crisp. They mature to red from a pale green color about 90-100 days after the seedlings emerge. The body of the peppers have very little heat, with the wings being sweet and mild.